The Windham Historical Society opened the doors of its Village School on the Village Green Aug. 25 during a grand opening celebration. Society members dressed in period attire gave tours of the building and talked about typical school days in the 1890s. Walter Lunt, former educational liaison for the society, acted as schoolmaster, performing skits with his grandson, Keagan Farley, to demonstrate what students in the late 19th century would have experienced. The event was well attended and the society was happy to see so many young faces in the crowd. A few children even dressed in clothing of the time making the event even more authentic in feel. This was a real opportunity to see that history can be fun and it brought history to life for the people who attended. Join Claire Olson-Crocker as she shares her slide show that spans the country from the pines of Maine to the redwoods of California, with a little side trip to Hawaii along the way. The presentation will take place Wednesday, Sept. 12, from 6-7 p.m. at the Windham Public Library. This is armchair travel at its best and is a fascinating way to spend an hour of your time. For more details, call 892-1908. The Windham Veterans Association will hold its annual meeting Monday, Sept. 17, at the Windham Veterans Center. All VFW and American Legion members are encouraged to attend. This is an important meeting where election of new officers will take place. It’s also a good opportunity to get out and mingle with other vets. The Thrift Shop at North Windham Union Church is having a special sale Sept. 12 through Oct. 12. Fill a bag with anything and everything it will hold for just $5. There are lots of treasures to choose from, including baby clothes, adult clothes, dishes, vases, housewares, books and more. The shop is open on Wednesdays and Thursdays and the fourth Saturday of the month from 10 a.m. to noon. It’s located right beside Amato’s on Route 302 in North Windham. Deborah Freedman spent 10 years making panels for and telling stories about the Names Project AIDS Memorial Quilt. She and other caregivers across the country stitched pieces honoring the AIDS patients in their care or whom they had lost. Each panel has a story to tell and at 1:30 p.m. Monday, Sept. 10, at the Windham Hill United Church of Christ, a few of these stories will be featured in a program,”I Choose to Love.” Stories will be read by Freedman, Mike Harris, Vernon Cox, Phyllis Blackstone and Anne Weber, and a piece of the quilt with eight Maine panels will be on display. The Windham Hill United Church of Christ is located at 140 Windham Center Road. Admission to the event is free and all are welcome. The Windham Historical Society’s program for September is a bit different from the norm. On Sunday, Sept. 23, it will offer a tour of Friends Cemetery on Route 202. Friends Church Pastor Janice Beattie will highlight graves of early, notable Windham residents and discuss the origins of Quakers in our town. The cemetery tour will begin at 11 a.m. Participants are welcome to attend church service at 9 a.m. at Friends Church if they wish. For more information, call the Historical Society at 892-1433. The Windham Parks and Recreation Department is giving Windham’s senior citizens an opportunity to put a little mystery in their lives by treating them to a mystery lunch on Tuesday, Sept. 11. The food promises to be delightful, but you won’t know where you’re going until the day of the trip. The cost is $10 for the bus ride. Participants pay for their own lunch, which is estimated to cost about $18. The bus leaves from the Windham Parks and Recreation Department parking lot at 8 School Road at 11 a.m. and will return at 3:30 p.m. Call 892-1905 for more details about this intriguing adventure. VNA Home Health Hospice is offering an open grief support meeting on Monday, Sept.10, from 6-7:30 p.m. at the North Windham Union Church, 723 Roosevelt Trail. Anyone who is grieving the loss of a loved one is welcome to attend. For more information, contact Linda Hopkins, the Bereavement Support Coordinator for VNA Home Health Hospice, at 400-8714. 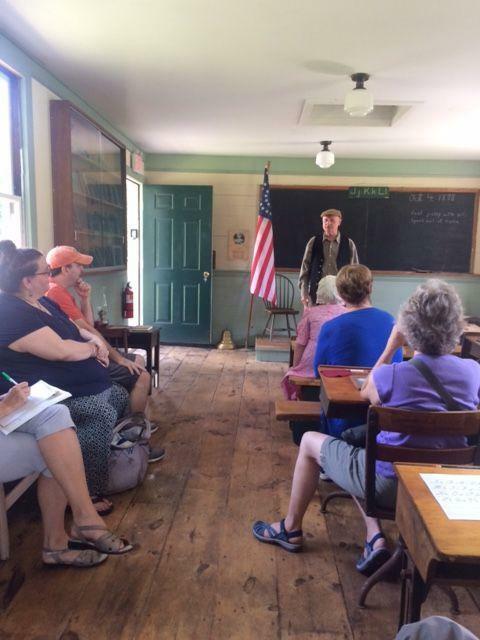 Walter Lunt acted as schoolmaster during the grand opening festivities at Windham Historical Society’s Village School. The Christensen sisters, Lily, left, Eden and Chloe dressed for the occasion at the Village School grand opening. That’s Haley Pal at far left.